It’s no wonder that Alsatian wines are very misunderstood and often overlooked by the average consumer. They’re made in French towns with almost unpronounceable Germanic names (often prominently featured on the label), distributed in bottles more reminiscent of German Riesling than brands from Bordeaux, Burgundy or most anywhere else in France. Many carry unfamiliar designations like Selections de Grains Nobles and Vendange Tardive, and what’s in the bottle may not be the varietal on the label. 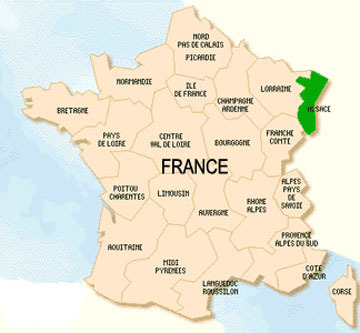 However, this area of France produces some excellent, extremely well-priced wines – so it is worthwhile to become familiar with a least a few top bottles. Also, in 2011 there were excellent weather conditions for ripening, with many full-flavored wines, and while 2012 saw a reduced quantity of grapes harvested, the overall quality was excellent – making most of the wines from these vintages especially noteworthy. What follows are recommendations of the best bottles recently sampled at Manhattan’s Felidia Restaurant by the Wine Media Guild (an organization of professional wine communicators). The wines are listed by category with top-flight representative samples for each category. Prices quoted are typical retail cost for 750ml bottles (not including state taxes). Made by the traditional Methode Champenoise (in which bubbles are produced by a secondary fermentation in the bottle), grapes allowed by law in these effervescent wines include Riesling, Pinot Blanc, Pinot Gris, Pinot Auxerrois, Chardonnay and Pinot Noir (especially for rosé bubbly). Valentin Zusslin Crémant d’Alsace Brut Zero Sans Soufre NV - $26. This wine is produced without the use of sulfur, mainly from Pinot Auxerrois (95%) grapes and small amounts of Chardonnay and Pinot Gris from 25-year-old vines grown at Clos Liebenberg, in the town of Orschwihr. It has a steady stream of bubbles, with a yeasty bouquet, a dry, citrusy taste and a rather tart finish that matches well with smoked salmon and caviar. Joseph Cattin Crémant d’Alsace Brut NV - $19. Made from a blend of Pinot Blanc, Pinot Gris, Riesling and Chardonnay grapes that are hand-picked and fermented under temperature control and aged in the bottle for 12 months. Good stream of fizz with a pleasant, yeasty bouquet and a fruity finish taste. Try it with shrimp cocktail and makes an elegant accompaniment to lobster. Pierre Sparr Crémant d’Alsace Brut Rosé NV - $20. Until recently the many different Alsatian wines produced by this company were generally inconsistent and mediocre at best. However, for the past five years a new emphasis has been placed on quality and this bargain-and-a-half sparkling rosé clearly demonstrates the results. It shows a salmon pink color, a long lasting stream of pinpoint bubbles bursting with a bouquet and taste of strawberries and ripe peaches with long-lasting memorable finish. Drink this wine alone as a toast, with mild cheeses or even delicate fish such as turbot. By law these wines can be made from 100% Pinot Blanc grapes, a blend of Pinot Blanc and Pinot Auxerrois, or 100% Pinot Auxerrois. The importance of this is that in general Pinot Auxerrois is closer in flavor to Chardonnay than Pinot Blanc which is quite more acidic, with the bouquet and flavor of these wines at times quite dissimilar. On the other hand, all of these wines usually make good mates for flavorful dishes like spinach-flavored risotto, pasta primavera with pesto or grilled veal chops. Paul Blanck Pinot Blanc 2013 - $16. This wine is made from grapes grown on an estate dating from the 17th century (in the village of Kientshelm) that are gently pressed and fermented using natural yeast in temperature-controlled steel vats. It has a pale yellow color, a bouquet and taste of melons and citrus, with a long smooth finish. Domaine Pfister Pinot Blanc 2012 - $24. Made from a blend of Pinot Blanc and Pinot Auxerrois grapes harvested from vines planted in the early 1970s in the northerly village of Dahlenheim, that are vinified and aged in stainless steel tanks. It shows a straw yellow hue and a taste reminiscent of an unoaked Chardonnay, with hints of apples and melons in the bouquet and on the palate and a crisp finish. While wines from the Gewürztraminer varietal are produced elsewhere, particularly in Germany and the United States, this pink-skinned grape featuring a high natural sugar content, is originally from Alsace where it yields generally aromatic flavorful wines. While often touted as accompaniment for spicy Asian fare, I find the combination overpowering and prefer these products with fois gras, roast duck and even braised short ribs – favoring Rieslings and palate-refreshing sparkling wines with spicy foods. Ehrhart Gewürztraminer Herrenweg 2012 - $22. Made from 100% Gewürztraminer grapes grown organically and sustainably on the sun-drenched Premier Cru Herrenweg vineyard, located between the villages of Turkheim and Wintzenheim. This sunglow-yellow wine shows a bouquet and taste of cloves and roses with a smooth pleasant finish. Weinbach Gewürztraminer Cuvée Theo 2012 - $38. Albeit a bit pricey, this outstanding wine is produced from grapes grown on the Clos des Capucin vineyard, at the foot of the Schlossberg Hill, where the Capuchin Monks once hid their treasures. It has a fragrant bouquet of spice and lychees with a well-balanced taste of fruit and acidity, and a long-lasting finish. Albert Mann Gewürztraminer Grand Cru Steingrubler 2011 - $36. Grapes for this biodynamic wine hail from a vineyard that faces southeast and is composed of rich limestone. It shows a golden-yellow hue and a lush, somewhat sweet bouquet and taste of cloves and mango, with a memorable finish that lingers on the tongue. Riesling, the most widely planted varietal in Alsace (over 20% and increasing), is most commonly vinified to dryness in this region (with some notable late-harvest exceptions carrying special designation and usually quite pricey). In general, these wines are quite fruity in their youth and as they age over 4-5 or more years, develop a lush taste and mineral-like fragrance (that some find akin to gasoline). Marry these wines with seafood, pork roasts, goat cheese and spicy fare. Francois Baur Riesling Herrenweg 2012 - $20. This wine is made from biodynamically-grown grapes that are vinified to dryness and aged for ten months in large 100-year-old casks (foudres). It has a bouquet and taste of citrus and lychees and a dry, smooth finish. Willm Riesling Grand Crus Kirchberg de Barr 2011 - $23. Grapes for this wine – hailing from a specific area in a vineyard about a 20-minute car ride south of Strasbourg that is noted for its warmth – are gently pressed, fermented and aged in large vats. It shows a bouquet of ripe peaches and lychees, with a rich taste of fruit and almonds and a finish bordering on sweetness. Wines from this grape, originally known as Tokay d’Alsace, had a name change because of confusion with Hungarian Tokaji, which is made from an entirely different varietal. Importantly, Pinot Gris wines produced in Alsace are typically more complex and more acidic than those made from this grape in Australia and Italy (where wine from this grape is known as Pinot Grigio). Also, many of the Alsatian products show a bit of almond flavor and spice in the finish. Enjoy these wines with grilled chicken, salmon and cheeses with a nutty flavor like Jarlsberg and cheddar. Zind-Humbrecht Pinot Gris 2012 - $26. Made from grapes grown biodynamically in a vineyard noted for gravelly soil, the wine was vinified to dryness and aged on its lees for several months before bottling and release. It has a bouquet and rich taste of ripe fruit and exotic spices with a lively finish. 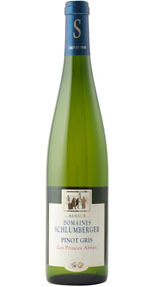 Domaines Schlumberger Pinot Gris Les Princes Abbés 2010 - $20. Grapes for this wine come from a south-facing Schimberg vineyard in the Guebwiller Valley that is noted for volcanic soil. Following temperature-controlled fermentation the wine is aged on the lees for 6-8 months prior to bottling. It has a straw-yellow color, bouquet of ripe pears and melons and an opulent, honeyed taste with a zesty finish. 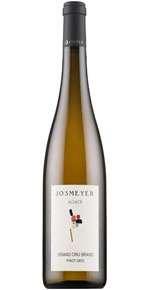 Josmeyer Pinot Gris Grand Cru Hengst 2007 - $75. This is an excellent example of the ability of Grand Cru Alsatian wines to age gracefully over 5-10 years. Produced from biodynamically-grown, hand-picked grapes from a mountain vineyard at an altitude of over 1,000 feet above sea level. This wine was made by gently pressing whole clusters of grapes, with fermentation initially temperature controlled but then allowed to progress naturally and aged in steel tanks. It has a golden yellow color, intensely fruity bouquet, and taste of wheat and ripe peaches with a honeyed finish.